My plan had been to climb Bynack More and camp somewhere on its slopes. 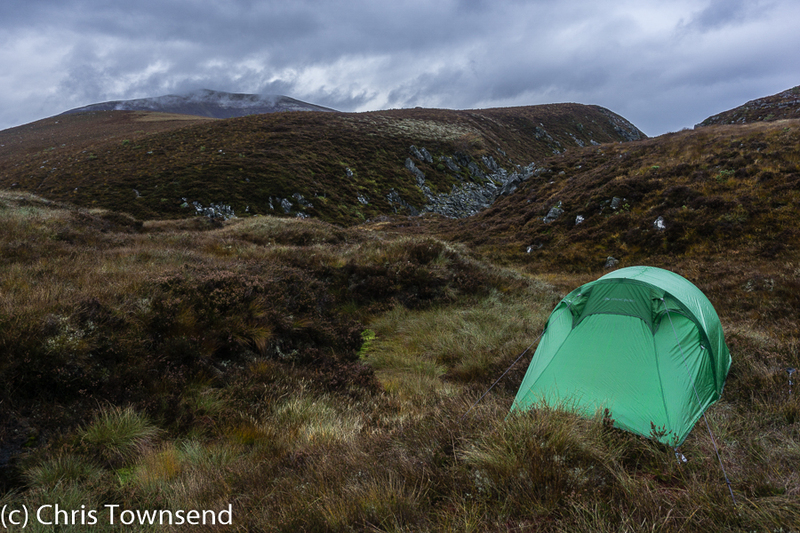 Low cloud shrouding the summit and a stronger wind than forecast changed my mind soon after I set off from Glenmore. Winding my way through the autumn colours of the forest I decided to visit a little-known corner of the Cairngorms and make my way up a narrow corrie with a little ravine at the top that I remembered descending many years ago. This isn’t named on most maps or mentioned in most books on the Cairngorms. It does have a name though – An Garbh-choire, the Rough Corrie – shared with the much, much bigger and better known one on Braeriach. The ravine at the top has a name too – Eag a’ Garbh-choire, the Notch of the Rough Corrie. 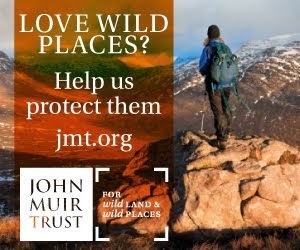 The only map on which I can find these names is the Ordnance Survey Explorer 1:25.000 Cairngorms & Aviemore. The only mention in a book is in Adam Watson’s SMC District Guide to The Cairngorms in which he writes that the on the descent of the long north ridge of Cairn Gorm to Ryvoan you will see “several crags and valleys, now almost dry, which were cut by great rivers flowing out from when the huge Glen More glacier was hemmed in here by Cairn Gorm and Meall a’Bhuachaille. Particularly striking among these are Stac na h-Iolaire and Eag a’Gharbh Choire”. Whilst little-visited An Garbh-choire is regularly passed by walkers heading for Bynack More or the Lairig an Laoigh. 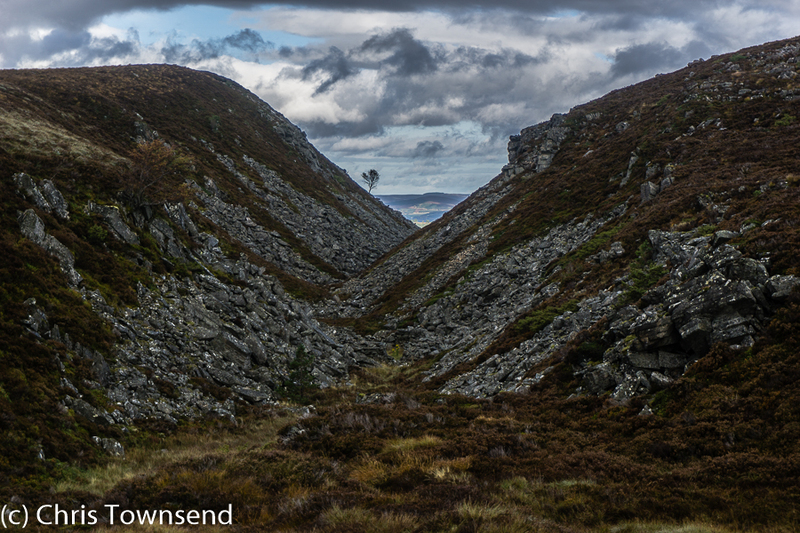 The wide track to these crosses the burn running out of the corrie but all that can be seen is a little glen with a few trees that doesn’t look like it goes far at all. That’s because it twists and turns and most of it is hidden. Even so, from the track to the moorland above the corrie is only a little over a kilometre. It’s a rough, exciting kilometre though. There’s no path and as the name suggests the terrain is rugged, all tussocks of grass and heather lower down, and gradually becoming rocky as the slopes rise. 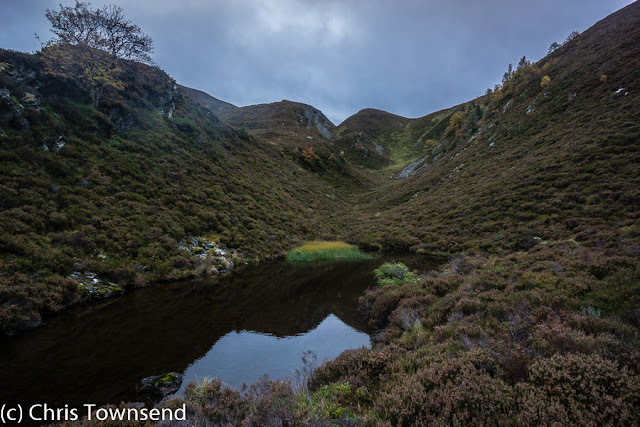 There are trees and crags and a little lochan in the lower corrie, making for a lovely secret world that feels cut-off and remote even though a popular path isn’t far away. 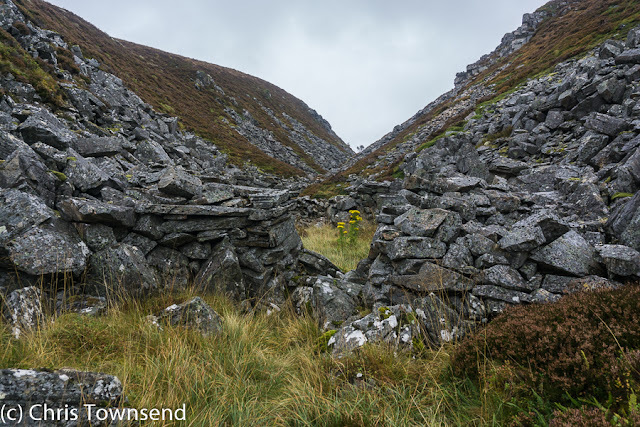 After a steep grassy climb I arrived at the Eag a’Gharbh-choire, a narrow boulder-filled ravine that echoes the much bigger and well-known Chalamain Gap away to the west. Here I had a surprise. Old stone walls blocked the ravine to form an enclosure, with a small gap at one end. More stone walls marked the remnants of a building. A summer shieling. I could see that animals could easily be driven into the enclosure and held there. Today the bright yellow flowers of ragwort were all it contained. 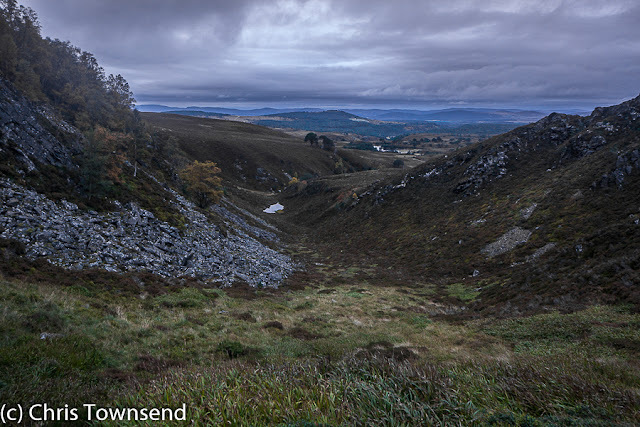 Above the ravine boggy heather covered the broad flat col between Mam Suim, the northern terminus of Cairn Gorm, and the spur of Creag nan Gall that rises above An Lochain Uaine in Ryvoan Pass. After all the recent rain the ground was waterlogged and it took me a while to find a dryish area for my camp. The wind died down as I pitched the tent and a light drizzle fell. I thought how hellish this place would have been just a month before when the midges would have been swarming. 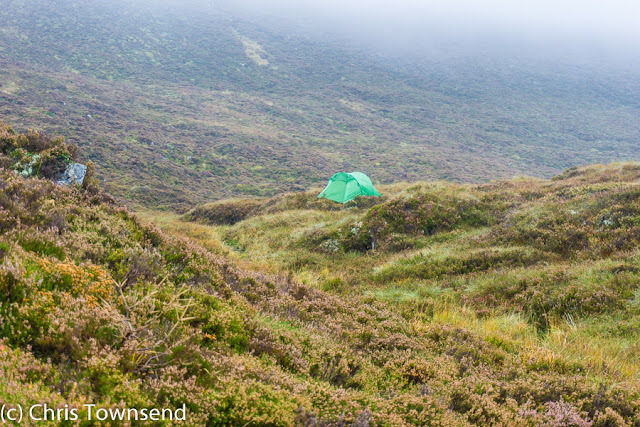 During the night heavy rain woke me several times and once I looked out to find myself camped in a wet mist. By dawn the rain had ceased and the clouds had risen a little. I watched them streaming fast across the sky and wondered why there was barely more than a breeze here. Setting off I found that by chance I’d had a sheltered camp. Within five minutes I was walking in a gusty wind that soon quelled any idea of going up Cairn Gorm. Instead I headed for Creag nan Gall, just 50 metres higher than my camp and at 622 metres only half the height of Cairn Gorm. It’s a fine little top though with excellent views down to Ryvoan Pass, west over Glenmore and Rothiemurchus Forests and north to Abernethy Forest. All those trees! Just wonderful. 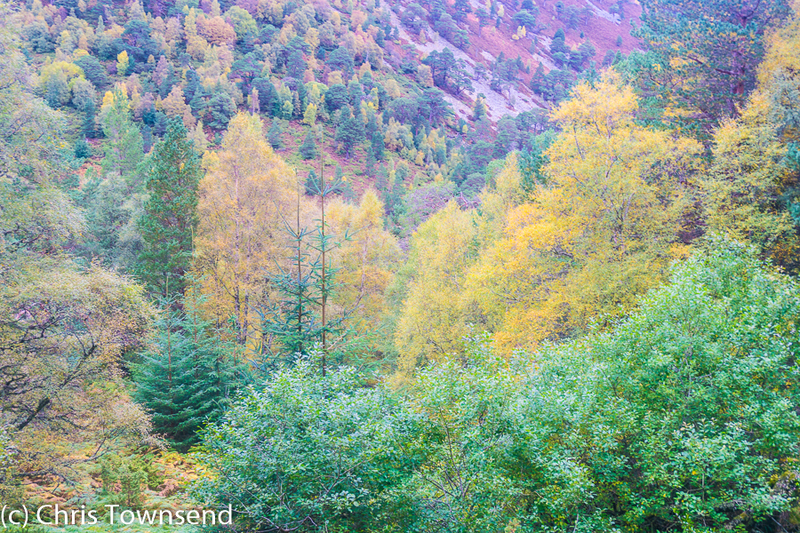 Also wonderful were all the young trees scattered over Creag nan Gall’s slopes, the forest advancing again. I descended the steep southern slopes of the hill over rocks and tussocks and then plunged into the forest and down even steeper slopes. I picked up a narrow path here, one I remembered coming down before. Wet and slippery, in places a mudslide, I thrashed down it clinging onto branches, heather roots, and rocks and occasionally sliding on my backside. The forest was a dense tangle of branches and roots, dark and colourful at the same time. Emerging on the broad Ryvoan Pass track was a surprise. Suddenly the going was easy. People appeared – neat, clean-smelling people with shiny boots and smart clothing. I was sweat-soaked, muddy from the knees down, and dishevelled. 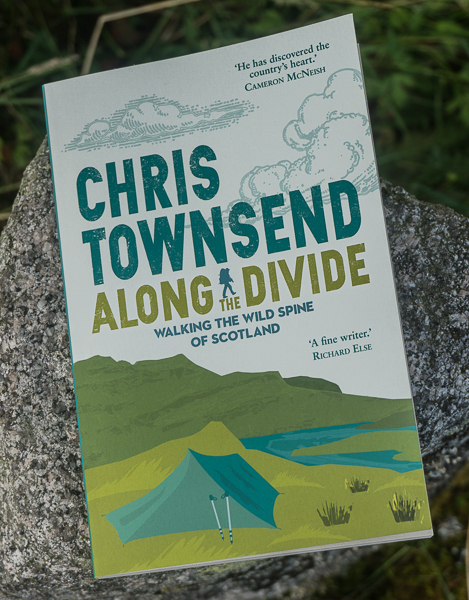 I’d been out one night and had only walked around ten miles but the rugged terrain had taken me far from paths and easy walking both physically and mentally. I felt as I did when encountering day or weekend walkers for the first time after weeks on a long-distance trail. I didn’t know I could do that on a 24-hour trip. It was quite a nice thought. Found this today as I looked for info on the Eag. I descended it this afternoon having walked up the intermittent old path which heads from Glenmore to the Ciste car park then cut across to the Eag, a good circuit. Someone had been there very recently removing Sitka spruce, maybe you...? No I didn't remove any Sitka spruce. Whereabouts was this? Quite near the top, among the rocks. I spotted about half a dozen - most less than a foot tall, pulled out, but one larger one had been cut. 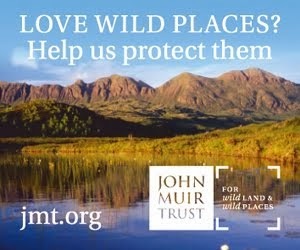 Presumably an attempt to stop the spread of non-native trees.